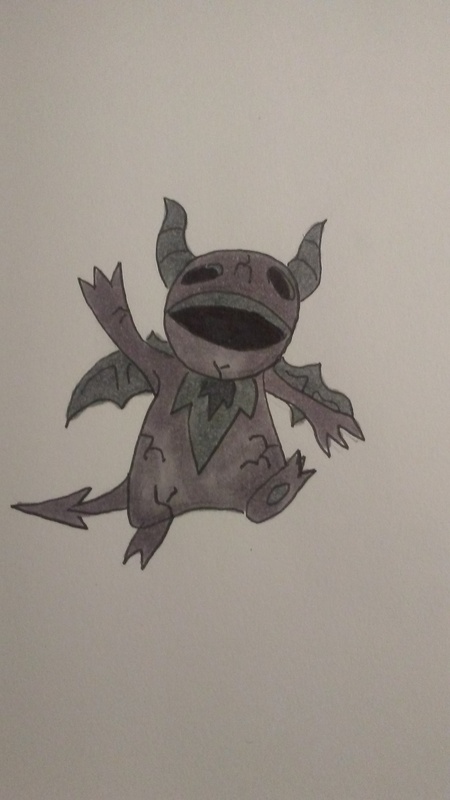 Dreamian are friendly Pokemon with a fascination with humans. Only seen at night, Dreamian gravitate towards communities and cities, entering homes and watching over people as they sleep. 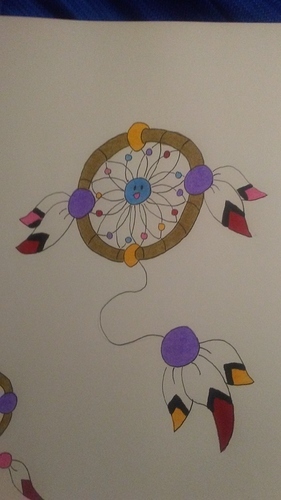 Appearing to always be sleeping, Dreamian hover over beds at night, causing good dreams and a peaceful slumber. It’s a symbiotic relationship though as Dreamian are recharged by the pleasant thoughts that they create in humans. Dreamian are small dreamcatchers. Their name is a combination of “dream” and “guardian”. At 10 HP, Dreamian have the lowest HP stat in my dex. An eternal symbol of happiness and hope, Evecatch constantly give off an aura that brings joy to those lucky enough to be near it. Only coming out once the sun goes down, Evecatch appear in communities where there is misfortune and despair. They fly around town, using their natural aura to cheer up it’s inhabitants. 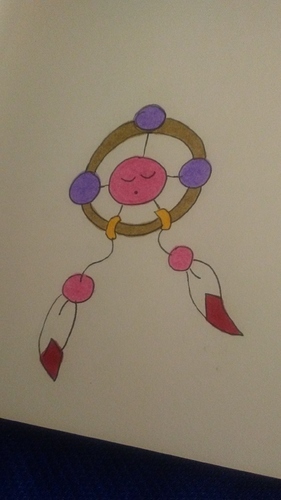 Evecatch are also based on dreamcatchers. It’s name is a combination of “evening” and “catcher”, as in dreamcatcher. Rockgoyle are rock Pokemon who like to pose as statues. Once settled in, Rockgoyle are impossible to move, waken, or catch. Rockgoyle frequent cities, gardens, and ruins across the globe yet are still very rare to actually find since statues representing them are also very common. It’s unclear if Rockgoyle evolved to this appearance based on the statues or if the statues were created in their likeness. The truth has been lost in history. Rockgoyle are based on small gargoyles. It’s name is a combination of “rock” and “gargoyle”. Gothgoyle are protectors and defenders of important buildings and locations. Hiding among the statues and architecture, a Gothgoyle can stay deathly still for days and weeks at a time. If an intruder enters the location they have chosen to watch over, however, a Gothgoyle will be relentless, attacking until their target has fled. A Gothgoyle can spend their entire lifetime in their chosen location. Gothgoyle is based on the classic gargoyle appearance. It’s name is a combination of “gothic” and “gargoyle”. Dragoyle spend far less time staying still as it’s pre-evolutions, preferring to actually live high in the mountains … the higher the better. That doesn’t mean that it does not disguise itself, however, as Dragoyle are rarely seen active during the day. Instead, they will routinely remain still if anyone is around, appearing to be a large statue guarding an important location. The location has to have some special relevance for a Dragoyle to decide to inhabit it though. Past cultures have built countless Dragoyle statues in hopes that they will attract a real one to watch over them. Dragoyle is a large gargoyle mixed with a dragon. 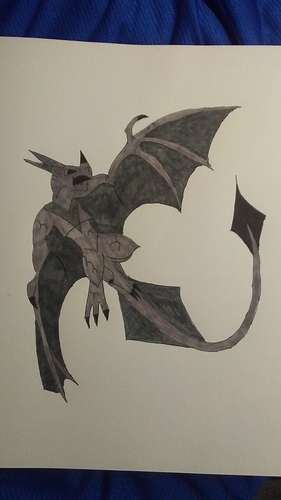 It’s name is a combination of “dragon” and “gargoyle”. Dragoyle is considered a pseudo-legendary. 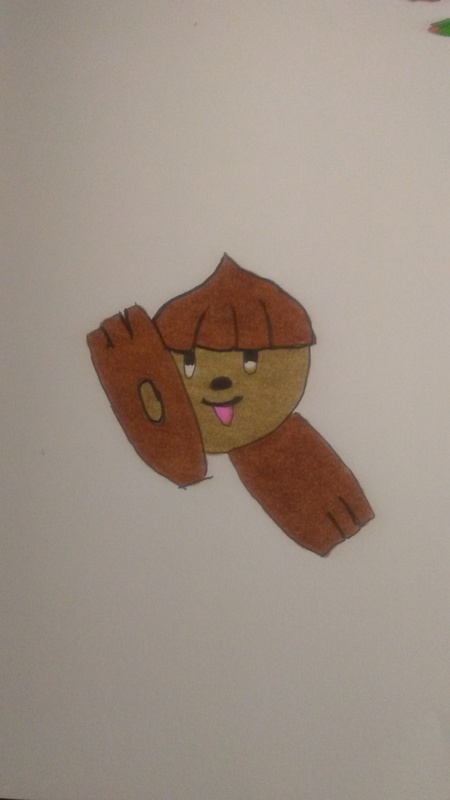 I am sorry I didnt upload the pokemon that was uploaded yet, was grounded and I might be able to do it tomorrow. Few homes are without a Vermshade or two, though no one would ever know it. 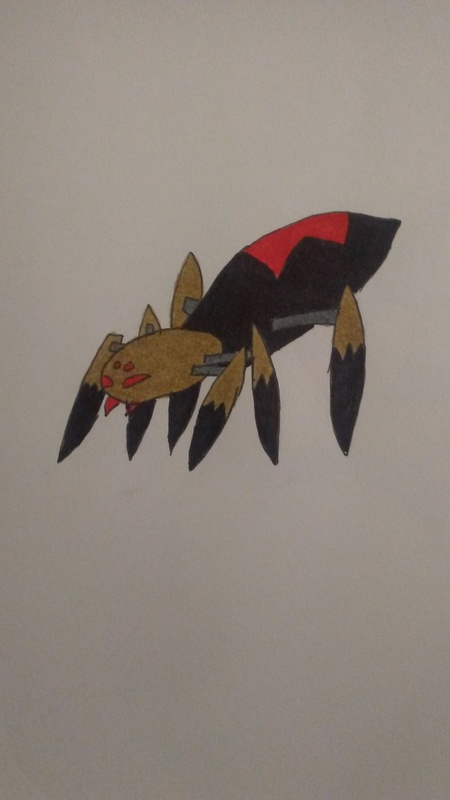 Hiding in the nooks and crannies of homes everywhere, Vermshade are slow moving spider Pokemon who spend a lot of their time hiding. With their small and fluffy bodies, Vermshade can fit into spots that seem impossible. Despite their appearance and venomous touch, Vermshade are not aggressive and are completely harmless. 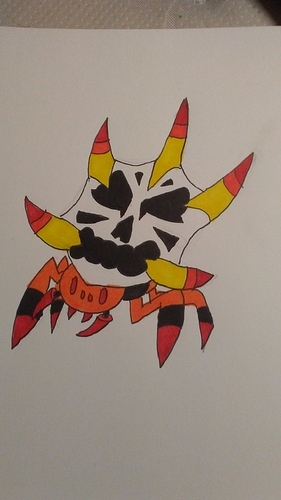 Vermshade are based off of small house spiders. Their name is a combination of “vermin” and “shade”. Unlike Vermshade, Noctantula are very dangerous and aggressive spider Pokemon who are constantly on the move. Only active at night, Noctantula relentlessly hunt smaller Pokemon, especially bug types. Their favorite meal, however, are Silpillar (See Below) and when they locate one they will not rest until they have consumed it. Noctantula are a combination of black widows and tarantulas. Their name is a combination of “nocturnal” and “tarantula”. The pride of bug collectors everywhere, Silpillar are sought after for their colorful appearance. A vibrant mix of purples, pinks, and yellows, few Silpillar ever look the same. Silpillar are also very useful as they produce a light thread when scared which can be used for clothing. 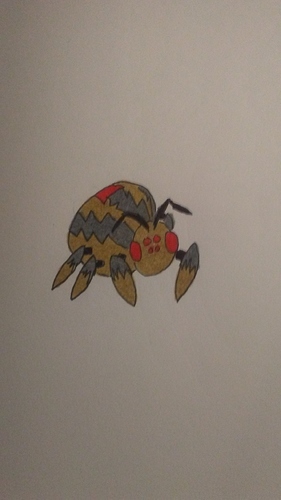 Due to their slow moving nature and bright colors though, they are frequent targets of predatory bug Pokemon. Noctanula stalk them relentlessly, looking for where they sleep a night. 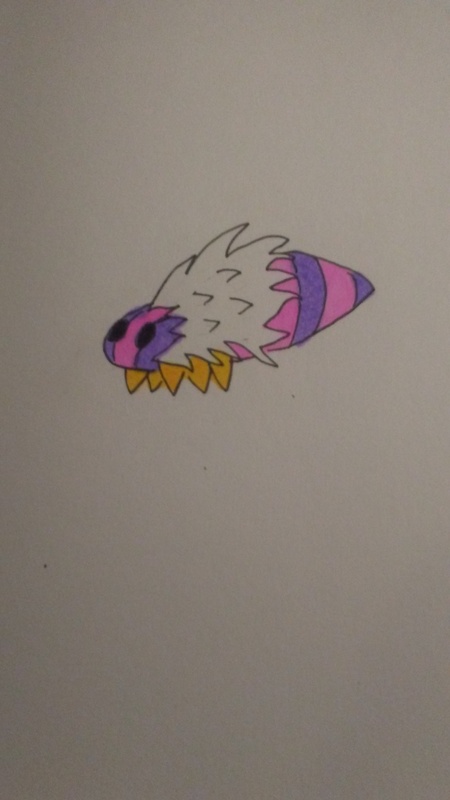 Silpillar are based on silk worms and fuzzy caterpillars. Their name is a combination of “silk” and “caterpillar”. Much like Silpillar, few Sylmoth look alike. Swirling patterns of purple, yellow, and pink cover this bug Pokemon and there are contests nationally to see who has the most interesting looking one. Sylmoth are fiercely protective of their pre-evolutions though and will protect them with their lives. 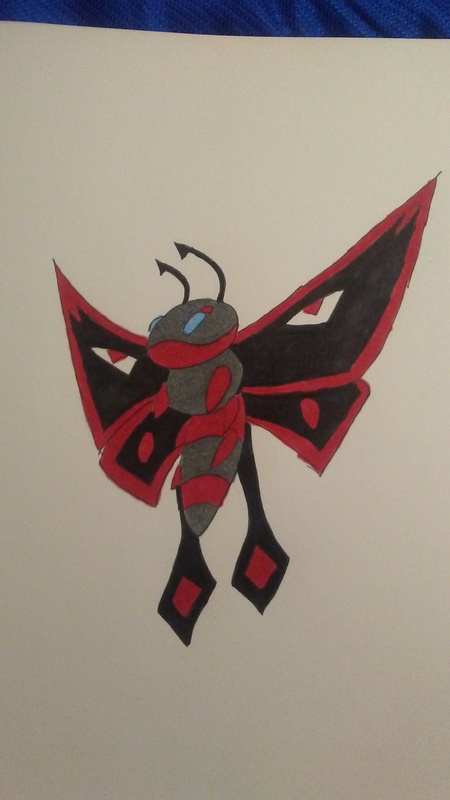 Bred often by trainers, Sylmoth are relatively rare in the wild. It is said that seeing one at night is a good omen. Sylmoth are based on Silk Moths and Venezuelan Poodle Moths. Their name is a combination of “sylvan” which is a fairy term, and “moth”. Unlike Sylmoth, Mortdusk are seen as bad omens and a sign of bad times ahead. 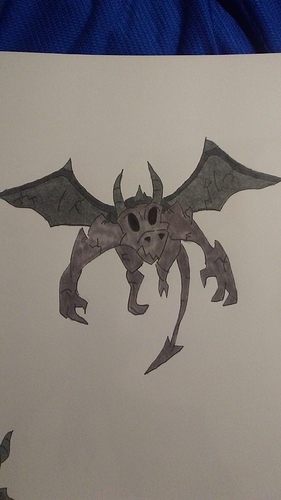 Mortdusk rarely ever attack anyone, preferring to hover overhead sometimes following a single individual for days. Other times, a Mortdusk will remain in a single location for days instead, as a harbinger of things to come. Catastrophes, accidents, and negative events seem to come within days after it’s disappearance. 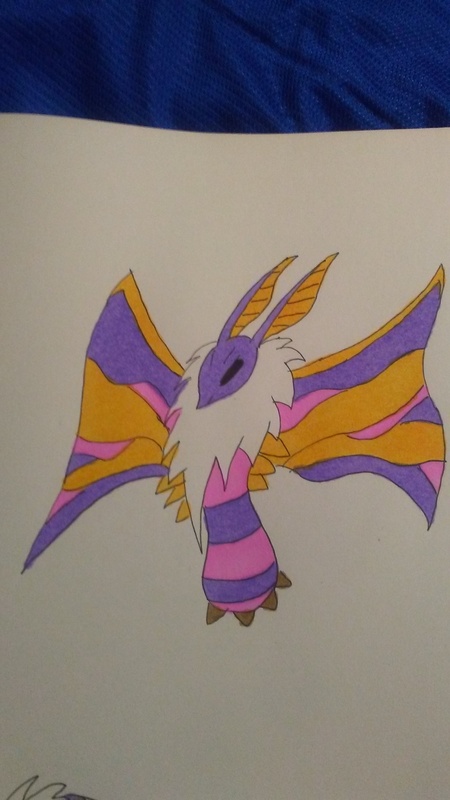 Mortdusk are based off of several moths and insects with fake eyes on their wings to scare off predators. It is also loosely based off of the mythical “mothman” who is said to appear as a bad omen days before it happens. It’s name is a combination of the prefix “mort-” which means death and “dusk”. Oh hey! I have a raptor too. Nice. Sasclod are so rare that some doubt they even exist. In fact, while still rare, their evolved form has been seen more often than Sasclod. Sasclod love to roam the countryside, especially forests and mountains, making large footprints wherever they go. They get great amusement from the fact that humans believe that a much larger creature is making them. Sasclod are based loosely on Bigfoot. Their name is a combination of “sasquatch” and “clod” as in dirt clod. Once thought to be extinct (or to not exist at all), Grasquatch are skilled at disguise and deception. They hide among the trees and grassy overgrowth, seldom ever seen. It is unclear how they are able to pull this off due to their size, and due to the fact that they give off a very distinct odor. 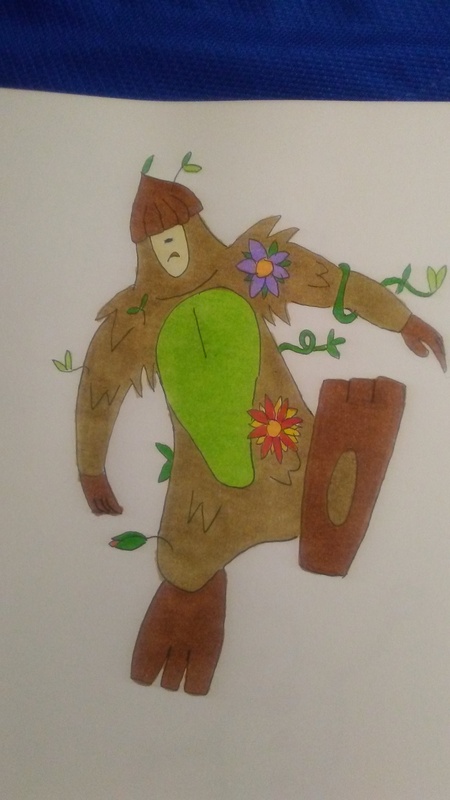 It is said that Grasquatch have magical qualities that cause plant life to grow in their presence. A variety of plants and flowers grow out of their coats, and it is said that no two Grasquatch look alike. Their footprints are found in desolate locations, usually with flowers growing in them. Grasquatch is based off of Bigfoot. It’s name is a portmanteau of “grass” and “sasquatch”. Snowical are round Winter Pokemon who only appear when the weather is cold. Snowical have a retractable ice horn and when they retract it, they can roll at great speeds, usually down steep hills. 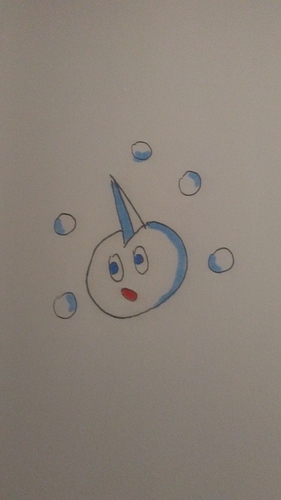 Snowical always appear to have several snowballs floating around it, which is an unexplained phenomenon. Snowical is the base of a snowman. It’s name is a combination of “snow” and “spherical”. It’s name rhymes with and is a play on the word spherical as well. Anthrolanche are what happens when two Snowical roll too fast and merge together. 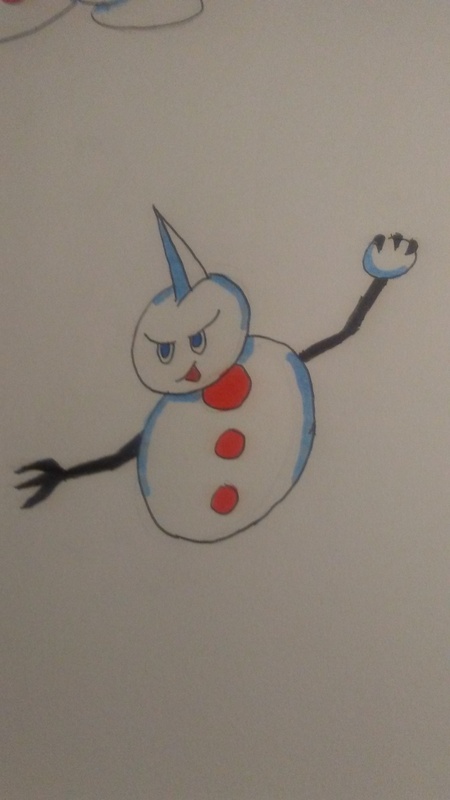 Playful Pokemon, Anthrolanche are a common site during snowstorms and when there is an accumulation on the ground, playing and starting snowball fights. They do not always understand their own power though and have been known to accidentally hurt someone while playing. Anthrolanche are always regretful when this happens. Anthrolanche are snowmen. Their name is a combination of the suffix “anthro-”, which means man and “avalanche”. Unlike their pre-evolutions, Rotundra are all business and are never seen simply playing. Fierce fighting Pokemon, Rotundra enjoy Pokemon battles and are very open to having trainers, which makes them much sought after due to how cooperative they can be. Despite their snowy appearance, the inside of a Rotundra is actually very hard ice. Using it’s large fists to pummel opponents, Rotundra can rotate the top segment of it’s body. 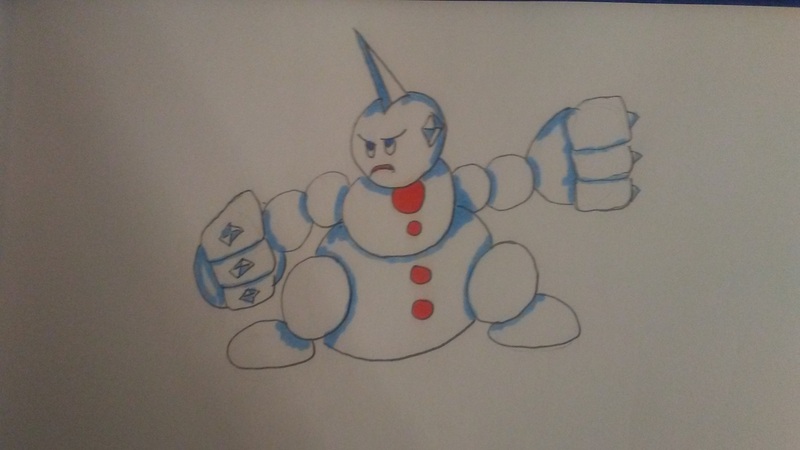 Rotundra are also based on a snowman, but a larger and meaner one. It’s name is a combination of “rotund” and “tundra”. Geonychus were rock Pokemon who roamed the globe in large packs. While packs of Geonychus would at times try and take down smaller prey, they would usually follow larger predators and try and steal their meals. Geonychus would rarely ever be found alone and would rather flee than fight if the odds were against them. If pressed into combat though, a Geonychus will swing it’s rock tail wildly, hoping to chase off any attacker away from them. Geonychus are based on both deinonychus dinosaurs and compsognathus. Their name is a combination of the suffix “geo-” and deinonychus. Geonychus can be obtained after finding a toe claw fossil. Electroraptor were feared predators who roamed in hunting parties of 2-4. 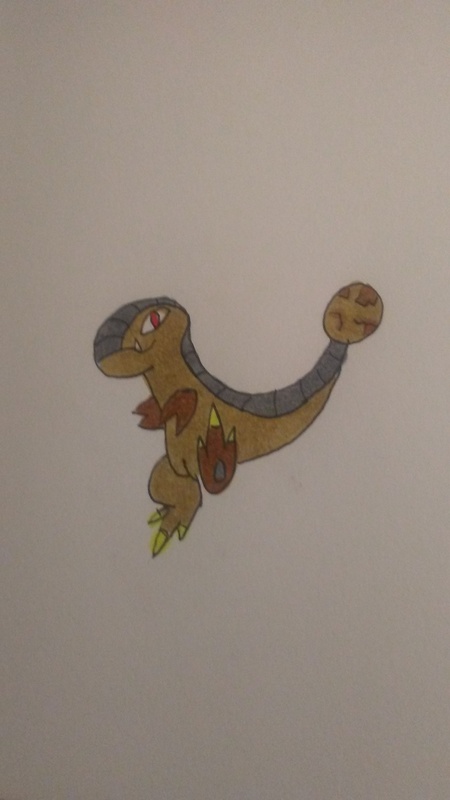 Exceptionally smart Pokemon, Electroraptor would rather outsmart and ambush their prey as opposed to overwhelming them. Capable of elaborate strategies, electrical attacks, and extra sharp claws, a couple of Electroraptor could easily take down much larger foes. It is said that an Electroraptor could defeat a foe with one kick from their powerful toe claw. Electroraptor are based on velociraptors. 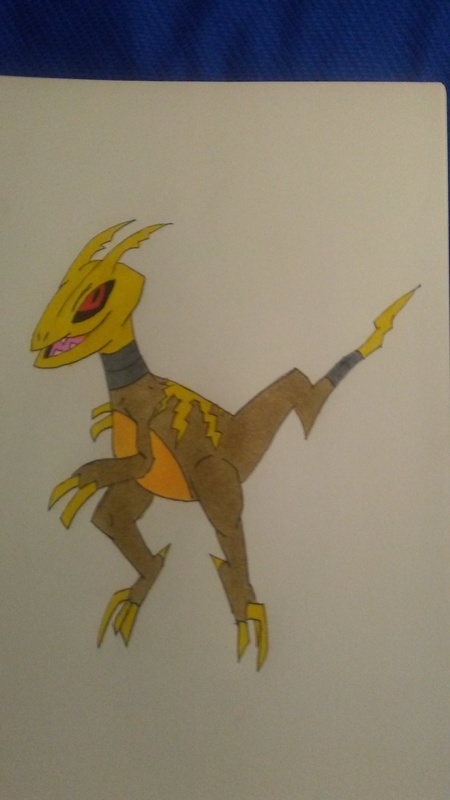 Their name is a combination of “electro” and “velociraptor”. Note: The basic design for Electroraptor is someone else’s. I just used it and made it my own. It’s 80% mine though. Platyke are common mammal Pokemon who inhabit freshwater everywhere. Trusting and curious, Platyke will walk right up to a trainer with zero hesitation. If a trainer plays with a Platyke long enough, they will usually let you catch them with no struggle or battle at all. Due to how abundant they are and their friendly nature, they are common early Pokemon for fledgling trainers. Platyke is based off of a small platypus. 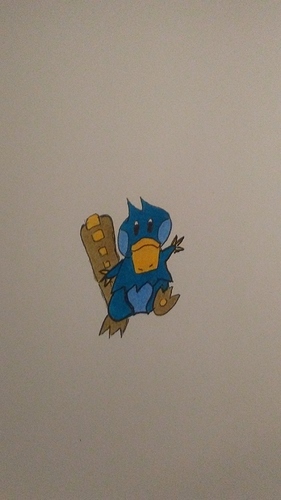 It’s name is a combination of “platypus” and “tyke”, which is a term for kid or child. Also a common sight in any body of freshwater, Platphoon are loyal and friendly Pokemon with a strong sense of community. Very protective of their homes, they will band together to attack any perceived threat. While they are less trusting than Platyke, Platphoon also tend to like humans a great deal and enjoy working closely with them. The enlarged barb on each claw is tipped with a deadly poison. It is common for Platphoon to accidentally poison other Pokemon as well as their trainer so it’s a good idea to be cautious around them. 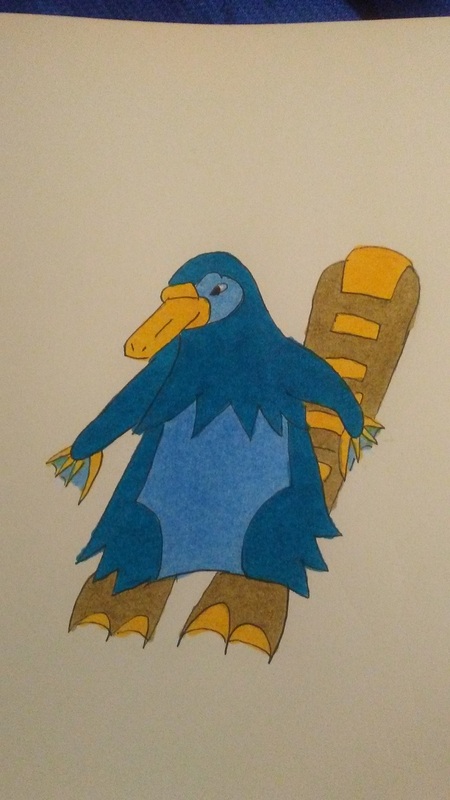 Platphoon is based off of a platypus. It’s name is a combination of “platypus” and “typhoon”. The basic design for Platphoon is someone else’s, I just re-colored it and altered it. It’s 70% mine though. I just don’t like to take 100% credit if it’s not 100% mine. Accelrock - Volt Tackle - Stone Edge - Earthquake? 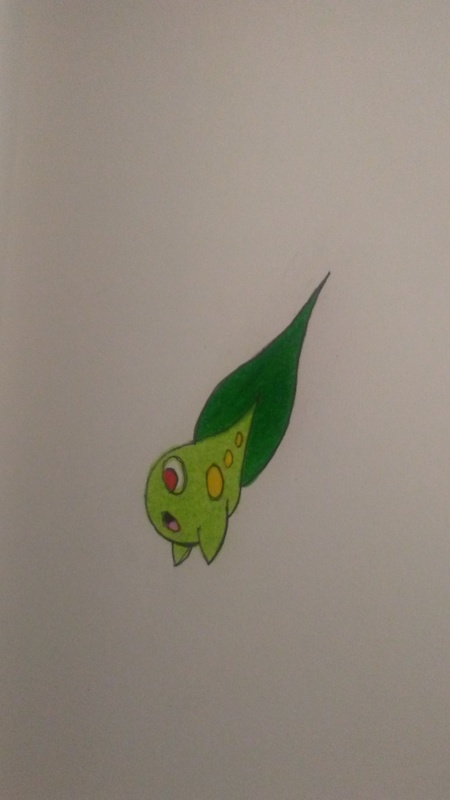 Tadswift are tadpole-like Pokemon who are incapable of staying still. Constantly on the move as if they are running from something, Tadswift have been known to even swim quickly in the same circle for hours at a time and it is believed that they never actually stay still long enough to sleep. Tadswift are ultra common in any shallow freshwater and if you put a net in the water during the warmer months, you will easily catch a several of them in a matter of minutes. 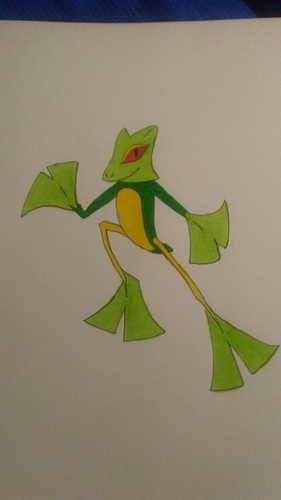 Tadswift is based on a tadpole. It’s name is a combination of “tadpole” and “swift”. Due to how difficult it is to find the evolution item required, Shinphibian is actually quite rare. Once seen though, it is a sight to behold as it leaps around in swamps and marshes. It’s hands and feet appear to be simple lily pads, but don’t be fooled as they are actually quite sharp. Shinphibian spend a lot of time cutting down overgrowth in the areas surrounding their homes and their hands and feet are sharp enough to cut down small trees. Shinphibian are based on a tree frog with Japanese war fans as weapons. It’s name is a combination of “shinobi” and “amphibian”. Bullywart are mean Pokemon who try and impose their will on anyone or anything that they come across. Using their cheek pouches and large throats, Bullywart can make a series of strange sounds that will attract other Pokemom (and people) so that they can try and swallow them whole. Bullywart also take great joy in confusing others with their sound-creating abilities. 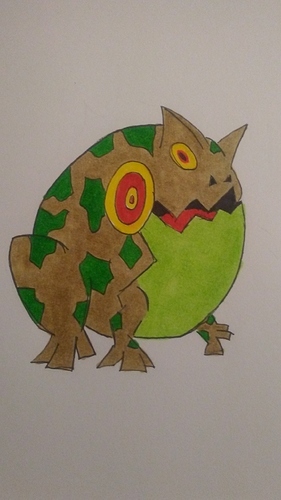 Lastly, Bullywart can also be exceptionally loud and it is said that if multiple of them start making noise at once, they are capable of bursting eardrums. Bullywart is based off of the common bullfrog. Been busy, but have some stuff to post soon! These are all drawn, just need to be inked and colored. Spydorb make gigantic webs capable of capturing human size prey … and larger. Vicious in nature, Spydorb are avoided by all flying Pokemon. Partially due to their mean nature, but also due to their near impenetrable armored shell. Spydorb are also notoriously difficult to train, and are usually only caught by more skilled trainers with a lot of patience. Despite their nature, they make the most beautiful and ornate webs that they are quite proud of. Spydorb are based on a variety of different orb spiders. Their name is a combination of “spider” and “orb”. Apex predators on forest floors, Cranipace are feared by both Pokemon and humans. Lurking in the shadows, Cranipace are very aggressive once they’ve decided to attack. It’s face-like shell scares off any larger attackers and some have theorized that the face might not be fake at all. Indeed, at this point it is unclear whether or not both faces have their own minds or if the front spider-like face is actually the fake one, while the more menacing skull-like visage is real. 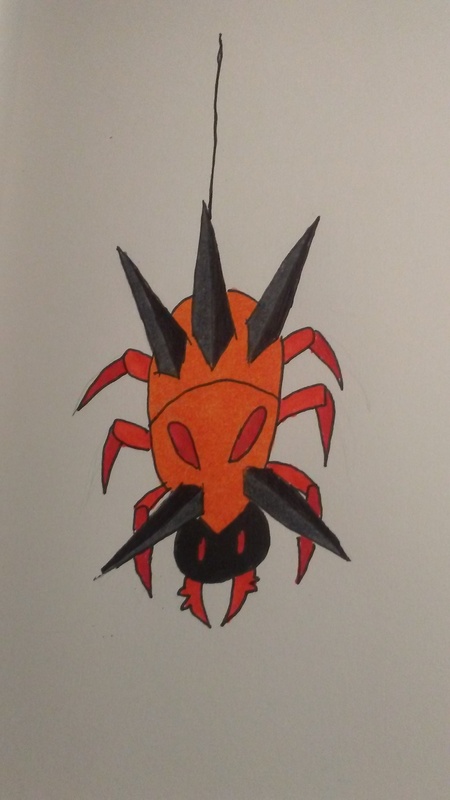 Cranipace is based off of a crab spider. It’s name is a combination of “cranium” and “carapace”.